This is the second resource we uncovered through Visage. Yesterday we shared with you their excellent post on the 11 tips for creating beautiful presentation slides and today we are introducing you to this equally important resource on how to tell a story with data. The process consists of five major steps. It starts with the identification of your overarching question and ends up with adding well designed visuals to illustrate your data. Crafting a compelling story is no easy thing especially when you have to deal with so much data that is at your disposal. 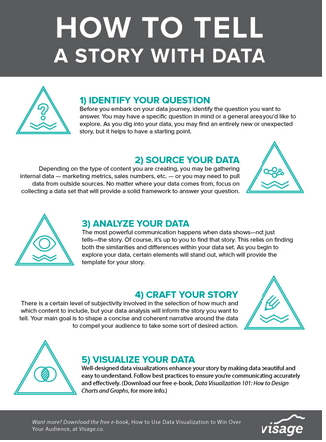 Sourcing the data, selecting the best out of it, creating a narrative out it, and then searching for visuals that can enhance readers understanding of your story are all elements that you should carefully attend to in order to ace your story.